A delicious and nutritious snack are soya nuts; whole soybeans which are processed to develop a crunchy texture and rich brown color. There is no need to pay a high price in the health food section of the grocery store for this nutritional treat, however; they are easily made in the comfort of your own home. The soybean has had a difficult time being recognized in the Western world for the beneficial food that it is, although it has long been valued in China. High in lean protein, isoflavens, minerals and vitamins, the small bean has only recently been embraced outside of China for its diverse nature and delicious flavor, not to mention its nutritional value. Soybeans are now grown in most areas of the world, with the United States accounting for roughly 50% of the world’s production. Soybeans can be enjoyed in many ways as a food, and rank very high on the nutritional scale. Green soybeans, or edamame, are great in salads. Beverages such as smoothies and milk are not only delicious but also great for those who are lactose intolerant. Tofu is a soybean product that is interchangeable with meats for use in main dishes, and snacks such as soya nuts can be munched on at any time of the day. Making a delicious and nutritious snack is easy with soybeans. 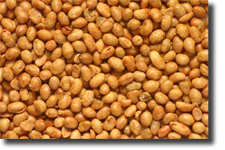 Dry beans can be purchased in most any grocery store nowadays, but are also available in all health food stores. As with any dried bean, sort through them thoroughly and remove any foreign matter and damaged product. The beans will need to be soaked in water by placing them in a large bowl or pot, then adding enough water to cover the beans by a few inches. Let them soak in the water for a full day, no less than eight hours for the best of results. For variety, soy sauce can be added to the water, or a good amount of your favorite spices and herbs. After soaking for the prescribed amount of time, drain the soybeans well and pat them dry. Preheat your oven to 350°. Using a well oiled cookie sheet, place the soybeans in a single layer and place the sheet in the preheated oven. Roast the beans for 30 to 60 minutes; checking them frequently and stirring them to distribute the oil and to rotate the beans. When the beans are a rich, brown color, they are finished. Add salt to taste and cool, then transfer the roasted soya nuts to an airtight container for storage. Instead of salt, a mixture of dried herbs can be tossed with the nuts. Many snacks are eaten with feelings of guilt, but this is not the case with crunchy soybeans. The nuts are almost equal to the whole bean in nutrients, protein and vitamins, and therefore a great way to obtain them while snacking. As the only plant that provides the same type of protein as animal protein without the fat, soy is a wonderful alternative for those who have issues with high cholesterol. Women who are premenopausal and menopausal receive the benefit of phytoestrogens in soybeans, which act as mild estrogens that can help to relieve symptoms created by decreasing natural estrogen in the body. Soy has been proven to reduce the occurrence of breast, colon and prostate cancers, as well as offer protection against diabetes caused kidney and heart diseases. Diabetes risk can be lowered substantially by consuming legumes such as soybeans, and blood sugar can be stabilized. The next time you reach for a snack, make sure it is crunchy, delicious soya nuts. Making them in your own home is not only easy, but economical and nutritious as well.